I have been an OS X users for years. I was always happy how it performed. Then came Yosemite and all changed. It was just one issue after another. Safari performance was poor, my garmin would no longer work. Then came the news that iPhoto was being replaced with Photos. This new change meant that syncing photos from the iPhone to the MacBook will now require sending your picture to iCloud. No longer was there direct sync from phone to machine. It was then I decided to move to Linux on my MacBook. Now I have been using Linux on my PowerPC machines, but kept my MacBook running OS X. So now came the decision of what distro to use. I first started Ubuntu 15.04, but I was not happy with Unity. There was issues that made some web pages barely readable, software center was having css issues and suspend was not working well on Apple hardware. Then I went to Ubuntu-GNOME and still the same issues. Then finally I went with Ubuntu-MATE. Ubuntu-MATE works great on this machine. All the issues I had with the previous flavors of Ubuntu were gone. 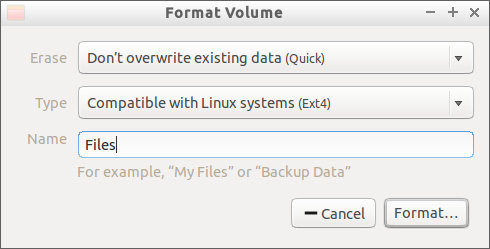 Plus all the features that Ubuntu-MATE team have added like one-click compiz activation and multi panel layout so if you are looking for OS X or Windows layout setting it up is pretty simple. The performance has been great so far. I could not recommend this flavor of Ubuntu more highly. Thanks to Martin Winpress and the team. A lot of people who were security conscious use TrueCrypt for disk encrytion. Sadly it was discovered to contain security vulnerabilities and for a while now it has been deemed unsafe to use. Thankfully there is an effort to audit the code. So hopfully this may be resolved in the future. Till then there is a really simply way to get portable disk encryption under Linux. First verify that the package cryptsetup is installed. If not then install it, sudo apt-get install cryptsetup. Once this is installed use the command fallacate to create a file of a paticular size (for example 100M). What the command did was creat the file test.img and allocate 100M of disk space to it. The extension is really not needed you create a drive without it. 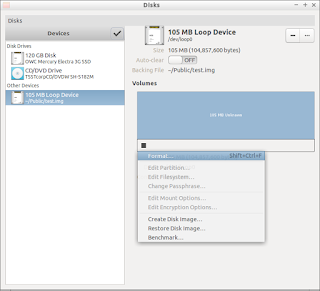 The next steps will be to use the disk utility that comes with the Linux desktop you installed to make this file into a loopback drive then create and encrpyted partion using LUX. 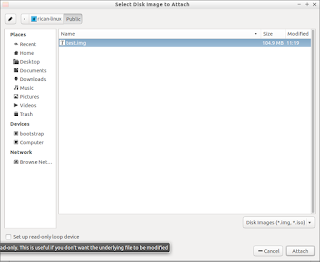 First open the disk utility and select attach image. Then goto the directory where the file is located. Before you select the file uncheck the read-only option on the bottom, then select attach. 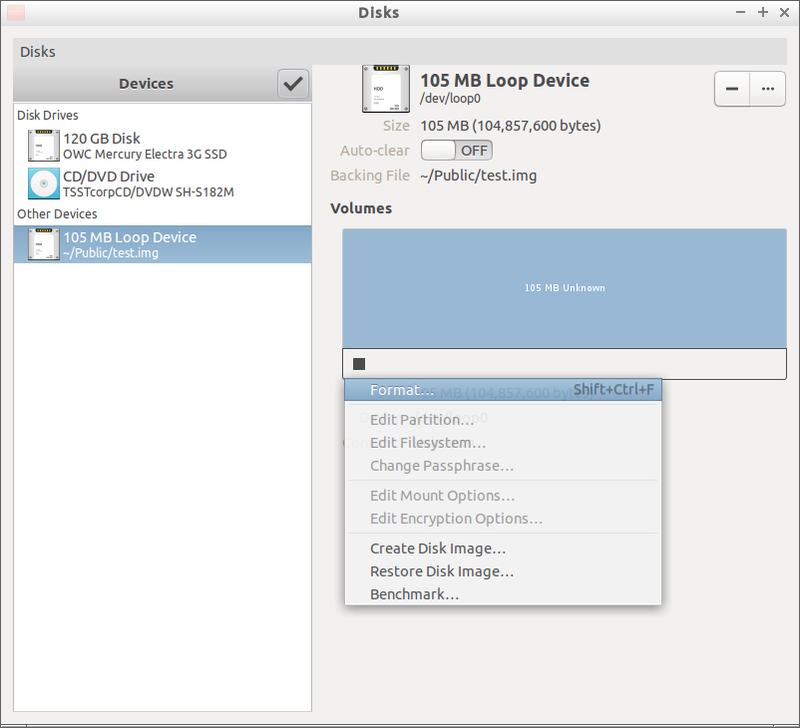 The file should now be seen as a loopback drive in the disk utility. 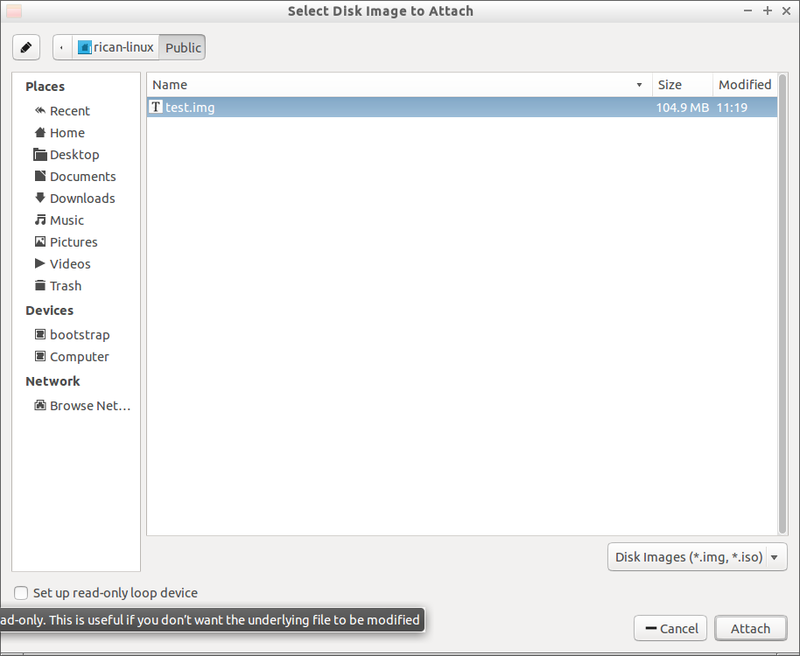 Once mounted use disk utility to format the loopback device with ext4. 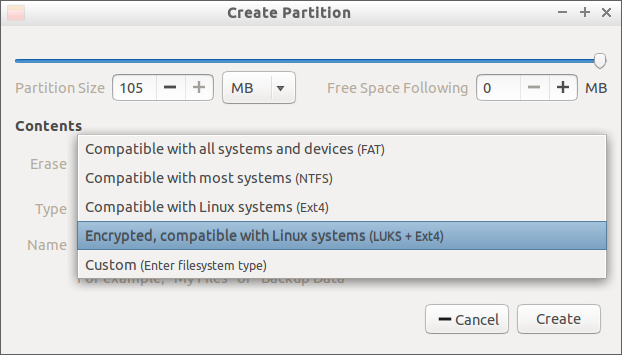 Once the device is formated to created your encrypted partition select create new parttion. Then enter the passphrase used to encrypt the volume. Be sure to make it complicated! Now you have a portable encrypted filesystem.